The start was announced long ago and the départ in the Vendée region isn’t too grand. Stages 1 and 2 use unremarkable, flat terrain where danger could come from the weather or the crash risk. The 35km team time trial on Stage 3 is the first test for the new eight rider squads, down from nine. The race then heads to Brittany, surely the region in France where cycling is most popular including a stage at home for the new UCI President David Lappartient, the mayor of Sarzeau will be on the podium for the finish of Stage 4 and Stage 5 starts chez Warren Barguil on its way to a punchy uphill finish in Quimper made for Peter Sagan. Stage 6 features the climb at Mûr-de-Bretagne and tackled twice this time. Stages 7 and 8 look promising for sprinters and siestas alike. Stage 9 takes place on the same day as the FIFA World Cup and comes with a route designed to draw attraction. Prior to the presentation the “leaks” had hinted at only sparing use of the cobbles but the reality is a summer sequel to Paris-Roubaix with over 21km of pavé (2014 and 2015 had 13km each) and high stress because one mistake or mechanical could see someone’s bid at the overall classification turn to dust. After a rest day for flâneurs on the shores of Lake Annecy Stage 10 is for the grimpeurs, 159km to Le Grand Bornand via the Plateau de Glières and its 1.8km gravel road. This part of the course will ensure curiosity but coming mid-stage it should not be decisive. The climb is hard, it’s the poorer cousin of the nearby Plateau de Solaison, steeper and rougher with 6km at 11% average – including 5km at 12% which is as hard as anything you’ll find in France – and irregular too. We’ll see if the climb is resurfaced because the tarmac is messy at the moment. Once at the top there’s 1.8km gravel road – the first since 1991’s stage from Pau to Jaca apparently – and it’ll create more of a buzz online that it will to the handlebars because it’s short and not technical but still puncture prone and could be messy if it’s raining before a fast and twisting descent. The publicity caravan won’t pass both out of respect for the war memorial that dominates the area… and because it couldn’t fit anyway, the road is limited to vehicles under eight metres length because of the tight hairpins and narrow road. Back to the racing and the stage finishes with the “Col” de Romme and Colombière double before dropping to Le Grand Bornand as used in 2009 and a very selective finish that may have the limelight stolen by the gravel but will provide an instant hierarchy to the GC. The Etape du Tour will use the same route too. Stage 11 is just 108km but packed with climbing. After a brief dash up the Doron valley it’s the hard Montée de Bisanne and chased by the Cormet de Roselend climbed this time via the Col du Pré, a gem of a climb which continues the theme of a “discovery Tour” seeking out new roads. The course then mirrors a stage of the Tour de l’Avenir in 2015 via the Roselend’s high speed descent with the finish at La Rosière, better known as the Col du Petit Saint Bernard and if they don’t reach the top of the pass there’s still 4,200m of vertical gain. 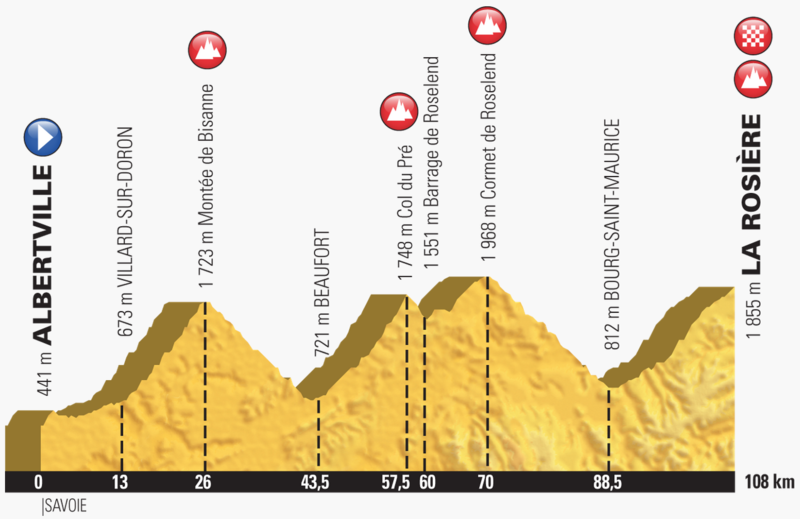 Stage 12 will satisfy traditionalists with a 175km route via the Madeleine, the Lacets de Montvernier and Croix de Fer before the ascent of Alpe d’Huez via the habitual hairpins rather than any side road, altogether 5,400m of vertical gain. Stage 13 leaves the Alps for Valence and a likely sprint finish before Stage 14 goes to Mende or rather the airport above the town and the infamous Croix-Neuve climb and will be targeted by the breakaway specialists who will also look to Stage 15 which heads to the Disney-style medieval city of Carcassonne via the Pic de Nore. Stage 16 and the race rides across the plains and into the Pyrenees including a brief incursion into Spain, tackling the ascent of the Col du Portillon by its gentler side means a toboggan run dash down into Bagnères-de-Luchon. Stage 17 is the day to put in your diary already – Wednesday 25 July – because it is just 65km and hardly a metre of flat road starting via the Col de Peyresourde, the twisting climb of the Col de Val Louron-Azet before the Col de Portet. Not to be confused with the Portet d’Aspet, this is a “new” climb for the Tour de France and currently a dirt track but due to be paved in time for the race. It will be the highest ever summit finish in the Pyrenees at 2,215m and the high point of the Tour. There’s 3,100m of vertical gain in just 65km and the Portet, even with tarmac, is steep and long, consistently over 10%, a festival of anaerobia. Stage 18 is one for the sprinters with a finish in Pau and it’s likely that the city acts as an accommodation hub for several stages in the final week. Stage 19 is the final day in the mountains and at 200km feels long compared to the other stages. It features the Tourmalet mid-stage with the Soulour-Aubisque combo in the finale but this time climbed via the Col des Bordères back route which hasn’t featured since the 1980s. Finally Stage 20 is a 31km time trial on rolling roads in France’s Basque Country to Espelette, famous in France for its peppers. It is on lumpy roads but not as hilly as the profile suggests. The race flies to Paris for Stage 21 and the conclusive laps of the Champs Elysées. Chris Froome is the obvious pick as he goes for a fifth win and if anything you wonder what what else will he aim for during the season, a crack at Liège-Bastogne-Liège ahead of a go in the Worlds in Innsbruck? Tom Dumoulin is being billed as Froome’s challenger but says he’ll wait for the Giro route and time is on his side, he turns 27 this winter and has a long term contract so there’s no rush and the single 31km solo time trial may well encourage him to lap Italy again. Otherwise Nairo Quintana and new Movistar signing Mikel Landa should make an interesting combo with Landa almost on home soil for the final stages in the Pyrenees. Richie Porte will be back. Home hopes rest on Romain Bardet can aim high again and if Warren Barguil can show up in the same form he’ll thrive too while Thibaut Pinot may too wait for the Giro route. Fabio Aru’s arrival at UAE Emirates probably opens the door for Dan Martin next July as the Italian champion can focus on his home race. Meanwhile Orica-Scott or whatever they will be called next year will be reassured by this route as it suits Esteban Chaves and the Yates twins. A plain start but things liven up soon. The nine stages prior to the mountains won’t be a parade of sprint stages thanks to uphill finishes and pavé. The course is for climbers with a lot of action due in the Alps and Pyrenees and time trialling reduced. Just getting to the first rest day will preoccupy contenders before they can begin to profit from the three summit finishes and the three other mountain stages. The sprinters get their chance with eight potential bunch finishes spread across the race. What unites all stages is brevity, this is the shortest course since 2002 and features several made-for-TV stages notably Stage 17’s 65km mountain mayhem. As well as the race this is a route to ride with several new roads that are off the beaten track, literally with the inclusion of gravel roads. This is a Tour to ride and if you’ve ever wanted to ride the route a day ahead of the race this is a great edition to try; or more realistically a fine chance to visit the Alps or Pyrenees. 262 days to go. 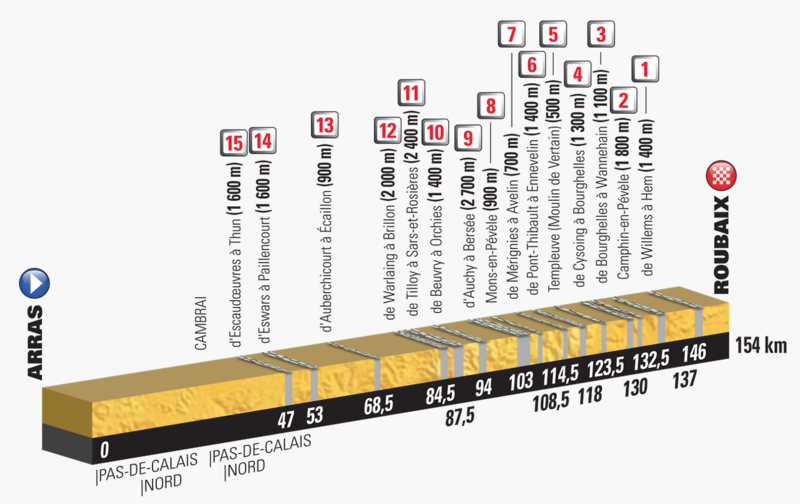 It begin to be very serious from stage 9. stages 10-11 and 17 will be great to watch. Good to see cobbles and dirt (at last). It`s a reel bike race after a slow start. But we need Dumoulin to create a challenge. And Nibali can shine a last time on that kind of course. I don’t really understand the point of the new intermediate time bonus. A sprinter might try to grab them for the first couple of stages, but after that the riders who are allowed away on breaks won’t care about a second or two, it will just mean the GC teams shutting down breaks earlier? It might not add much but we’ll see, it won’t take away much either. If one team dominates the TTT, then the bonus seconds will be meaningless to the typical breakaway riders. If a number of riders from different teams are close in time, then it will encourage the breakway to be caught early so that the leading riders can compete for the bonus seconds as most of those stages will finish with an intact peloton and there are no bonus seconds at the finish. My guess. We shall see what the racers make of it. The first yellow jersey wearer will be the winner of the time bonus sprint, not the winner of the first stage (assuming a bunch finish). In which cruel mathematics? Intermediate bonus is 3-2-1 , the stage winner still gets 10, then 6 and 4. So nobody than the stage winner can get the jersey. Even if the 2nd won the intermediate, he could only get 9 in total. As in the day they play for the cup, yes. Haha, I’m with Dave on that one, that sentence confused me too! Cup is more the format, as in not a series than the price (which you could also win in a series). I don’t use the acronym ‘FIFA’ anymore than I’d talk about the ASO Tour de France. It’s just the World Cup final. Hmm, I won’t be moving off the sofa all day. Belgium to take both? Cav has described it’s entirity as “brutal” on instagram, but acknowledges sprint opportunities in the first week of course. Time limit worries for some, apparently. Could be significant for the green jersey competition, since a UCI rule change for next year means any OTL riders who get reinstated will lose ALL of their points gained up to that point rather than just a fixed penalty of 25. The riders will dictate, but the parcours for next year certainly gives them plenty of opportunity to make the race both unpredictable and exciting. He didn’t go into this year’s the favourite. Look back at June’s articles across the web and he was anything from struggling to reaching a career end. He was favourite with the bookies and unsurprisingly so. Will be next year too in all probability. Those predicting his downfall this year were more predicting what they hoped was true, I think. People pay too much attention to early season results – many were saying that Valverde was looking like a favourite. I think Valverde realised that he’s very unlikely to win a grand tour and so made sure he peaked early season – thus he was better than everyone else at that time. That’s also sensible for the Ardennes. Froome will be the favorite until someone beats him. Even this year when he had a subpar early season he was the favorite at the start line. oh, I missed that Les Lacets de Montvernier were included. Nice. The Lacets are like a model village version of Alpe D’Huez. Scenic and picturesque, but not challenging other than to limit the number of riders that can cycle up it side-by-side. I’d be interested to see them do the D80 up to Albiez-le-Jeune. I’ve ridden both and that route up from Villargondran is disorientating and tiring. The sort of hill that gives rise to a Stephen Roche ascending from the mist moment. while I still find the le Tour most boring of the Grand Tours, I like how the ASO is trending this race. variety of stage lengthy, novelty with the route, hopefully I will cultivate a slightly different feel as days progress. even though every rider will be flying at one million kph across France and making the race as they see fit, the organizers have done well to at least set a stage for unpredictability. Excuse a comment from a local 🙂 — “the poorer cousin of the nearby Plateau de Solaison” – it’s far shorter, but, for what it’s worth, Glières is much prettier/more interesting climb imho. And as you said, steeper. Solaison can be very cold as almost always no sun on much of it. Plus Glières is a through road …. if one “braves the gravel.” So easy to make an interesting loop. (Solaison is pretty good too though). Here’s hoping that the Plateau de Glières gets a Roads to Ride entry. Looks intriguing. Wonderful cross-country ski centre in winter. Cheers, Will. That is superb. And your final thoughts in the article got answered! There’s a small typo in the section on recent pavé – was recently used in 2014 and 2015 not 2013. This seems a course that will not unduly worry Froome, who will be a guaranteed entry unless injured, and would also suit Vincenzo Nibali who will relish the several opportunities for surprises that this course provides. I’m not sure its tempting enough for Tom Dumoulin though. Remember, he needed 69.5kms of ITT in the Giro this year to beat his two nearest rivals by 40 seconds or less. So I’m not sure this route gives him enough insurance at less than half of those ITT kms. As for the likes of Quintana, Bardet and Landa, really? The summit finishes have been kept to a minimum again and any mid-length ITT almost rules them out in advance. 31kms of ITT won’t have them resting easy thinking about it. Richie Porte? He’s older than Froome and still never proved himself podium material over three weeks. Any course will test him to last the distance. Overall, I think they went for a course that makes it harder to control the race, mindful that one British team has had this race in a vice-like grip for most of this decade. It may induce more incidents and accidents (i.e. unpredictability) and its good to have new things to see but if one less man per team makes it harder for Sky it makes it harder for the others too. The best man has a habit of rising to the top regardless provided he crosses the finish line. I suspect, like a number of people, that no Dumoulin makes it easier for Froome but if he decides that the Giro is a better bet that’s ok. Only one man can win and you have to make the calculation of what you can win on your own terms. This course gives him reasons to explain why missing the Tour makes sense. Interesting. If it were Froome’s first defence I think it would worry him – but every course he’s won on has been a curve ball with various challenges so suspect he’s pretty much over worrying about them, sure most will be as worried by it as him if not more…. It is quite a challenge though, no? I actually think it’s super exciting and a brilliant course (speaking from afar and obvs not knowing every detail) – I expected the conversation to be Dumoulin-centred and didn’t think the course could be workable for Bardet without seeming samey to last year, but I was completely wrong. You could see a lot of people succeeding here – and the pitfalls mean it could easily be a surprise – that 65km stage, wow. Cannot wait for that. Surely will be madness. You may like to see Bardet win but how does he win where that would mean Froome and maybe others losing? 31kms ITT triangulates to something like a 2.30+ loss for him as against a Froome on any past analysis. This year’s Tour shows that he simply can’t drop Froome uphill to make that up. And if classics-like stages are, in some people’s eyes, a weakness for Froome then how much more so for paperweight Bardet? I would be very surprised if this course favoured Bardet over the likes of Froome, Nibali, Porte, etc. In fact, I see it as worse for him than this year’s (although I note he says the opposite). To clarify – not saying Bardet is favourite. I would just like to see a Frenchman win. Clearly Froome is favourite though. Bardet has proved himself over the last couple of years to be the best, or at least most consistent, of the paper weight none-time trailers queuing behind Froome. So I suppose if Dumoulin decides he’d be better off at the Giro and Froome falls off on the cobbles then he has a decent chance of winning. Obviously the chances of Froome falling or losing enough time to preclude him from winning are pretty slim. I’m a bit disappointed that the ASO have gone with a route like this. A couple of decent 30-40km time trials, one pan flat and one like the existing one, allowing Froome and Dumoulin to go toe to toe would be far more exciting than tuning in for 3 weeks in the vain hope that Froome/Sky suffer a disaster. I’d say Porte is a considerably better time trialist than Bardet… but then you get to the ‘falling off’ bit. I share most points you make here, but I think that you’re overrating the final ITT and underrating the potential importance of the first half in ruling out the contenders whom I myself would place, like you do, a little further back on the “starting grid”. After all, there’s a bit of a contradiction in your first sentences: it was precisely Quintana whom Dumoulin beat in May by that reduced margin despite the relative abundance of pure specialist ITTs *and* the lack of selective finales in the third week, besides a very soft second one. You might remember that Quintana beat Froome in a GT which included a longer and flatter ITT than the Tour’s. The 2014 Giro Quintana won included an over 40 km ITT which, albeit on rugged terrain, still was more suited to specialists than the Tour’s. In 2015, after having fought for the Tour, he was 6th in the flat 38 kms long Burgos ITT, losing just 90″ against a fresher Dumoulin. Quintana will always be limited by his available absolute top power in a flat ITT (which the Tour isn’t at all), but he’s got good skills and a very good disposition for that exercise. He’s not comparable to Bardet – after all, Quintana’s got a dozen or so top-tens in ITTs, half of which weren’t uphill. Bardet’s got… one or two? Landa is a mystery. He’s on Bardet’s level if we look at results, but since he’s been at Sky he showed glimpses of an unexplored ITT potential. Much depends on him being able to bring that along to Movistar or not. Agree with you about Porte, was it only for the fact that entering the decisive third week stages high on GC would be a totally new experience for him himself. The later, more experienced Froome of 2016 or 2017 wouldn’t ever have suffered in the 2013 third week as he did, nor would he lose the 2011 Vuelta (even repeating team strategies). But it will be hard for Porte to get the sort of advantage Froome could defend in 2013… Besides, Porte has often show a relative lack of bike-handling skills (I’m not just speaking of the more recent memories) and that could cost you quite a lot next year, too. However, the first half of the race will be a hard test for all these riders. Porte might enjoy solid support just as Bardet, I’m not as sure about the Movistar riders (Nibali probably won’t, either, but he may count on his skills, even if that’s not enough in case of bad luck). And, well, the 2015 pavé was a no contest with perfect weather, and even so the main group was reduced to less than 40 riders. A mistake on any sector far from the finish line and you could easily lose minutes. But all that is just fair, and all in all I like pretty much this route concept, albeit with some of what I consider flaws (but that’s just normal). It is great to read comments like this, thanks ! I agree with regards to Quintana’s TT ability, it is severely underrated ! He is never going to be on Dumoulin or Froome’s level due to his physiology but I think he is an exceptional TTer when compared to other pure climbers such as Pozzovivo. I think the route is a really good one as it does leave the door open for many different contenders. I don’t care who wins but I just hope it is entertaining. With Quintana at the top of his game, it will cause a serious concern for Froome allowing perhaps for more leeway to a rider like Bardet. As always gabriele you make valid counterpoints to my own. And backed up with relevant examples. Yet I get the feeling Quintana has got worse in recent years rather than continuing to improve and the incompetence of the Movistar management, using him like he was some workhorse lugging stuff out of a mine, sending him to grand tour after grand tour, has set him back some what. Overall, I’ve never felt that Quintana is or will be the all-rounder that Froome or Nibali is. And this hurts him in France every year at the grand tour that is the most all-rounder friendly of the three. His relatively poor, although not always disastrous, time trial (he still lost 2.53 to Dumoulin in the Giro’s 1st ITT this year though!) will still mean he needs a lead in races where Froome/Nibali/Dumoulin are present. What I noted from this year’s Giro, which you may not have seen since I read all your comments about the poor parcours, was the frequent inability of Quintana to drop Nibali, Dumoulin, Pinot and Zakarin. Whether that was because he has been overworked or because he has reached a plateau in terms of ability I don’t know. In any case, I would put him a step lower than Froome in any Tour rankings. Froome has 4 jerseys and 59 days in yellow in his career. Quintana has never worn yellow at all. As I’ve said elsewhere, I don’t expect Quintana to easily win any Tour, unless the 2015 route is offered again and again (and as I stated in this same page, I’ve strong doubts about the opportunity of such a route choice, was it ever implemented). How many 60 kgs or less riders have won it in the last 50 years? Three? Before the Proudhomme effect on the course, the last under 65 kg riders to win it had been Hinault and Pantani. Then, more hilly courses (breaking the hellish tradition of a flat first half and huge not-technical ITTs) brought in more under 65 riders, but most of them still were within the 62-64 kg range (at the start). As you say, the TdF traditionally focuses on a “perfect” and narrower all-rounder body type, while the Giro can be won by a broader range of physical types (think Indurain, Berzin, Rominger, Tonkov, Savoldelli, Basso, Hesjedal, Dumoulin). In the last quarter of a century, the Giro has been won some 45% of the times by riders well over the 65 kg marks, several of them even over the 70 kgs one. Along with ~60 kgs or less one like Gotti, Pantani, Simoni, Cunego, Di Luca, Quintana (30% of times) and 62-64 kgs ones (Garzelli, Contador, Menchov, Nibali, and Scarponi if you want). The recent trend is against pure climbers (10%) with a less evident reduction of heavier riders (30%) and a strong prevalence of “light welter” (60%). This year Giro’s course was heavily tilted against pure climbers: a lot of high-speed slipstream climbs, an excess of monoclimbs, the last selective climb frequently too far from the line (few little climbing in the last hour of race, most of the time), an horribly easy second week, never more than two mountain stages back to back. The final results are equally tilted accordingly. And so was the race, technically poorer than usual (albeit not bad – it’s the Giro, after all). As I said back then, 2’50” was around the higher limit of the fork of expected results for Quintana. The contingent race conditions, and the riders’, explain that. I share your worries about him, the team etc., but you seem to forget that he beat Froome in late 2016, not centuries ago, decent specialist ITT included. It’s hard not to consider that the 2017 season was conditioned by the Giro-Tour double attempt, with all its usual consequences. He even performed slightly better than I could expect in the finale of the season. However, this is not to say that your worries aren’t reasonable. As I just said, they are. Yet we need more elements to state anything meaningful and well-fundamented – unless we like wild guessing, but personally I don’t. Au contraire! I think that the ITT and TTT suit Sun Web down to the ground so Dumoulin is bound to fancy it. Plus I would hazard a guess that he may well be intrigued to see what it is like winning a ‘real tour’ against the toughest competition and not one of the Grand Tour Light versions. Looks like some interesting racing and the team selection may make things ever more interesting. This looks like a great route; an interesting mix of old and new. I’m all for short, explosive mountain stages and minimal TTing, but the cobbles still seem a bit out of place in a Grand Tour; 15 sectors and 21 km of pavé on Stage 9 is a bit much IMO. Do you know if they will be finishing on the Roubaix velodrome?! I’d like to see the caravan try to do that. 31 km? Really? The 2018 tour will be more negatively ridden than this year’s. When a Tour needs rain and misfortune to ignite it, it’s not a well designed one. Some people won’t be happy until time trials are banned. The idea of an all-round rider has never been less popular. What next, a ban on riders over 60kgs? In all fairness… as recent years have proved do the organisers have a better weapon than misfortune to put off Froome/Sky currently… Also not convinced with a 65km day plus the knowledge of what happened this year whether it will lead to negative racing… Finally, I think if Porte hadn’t crashed out his influence on last years race may have been the ice breaker, which might become a reality next year… Dave. Each time I’ve done the “moment the race was won” pieces after the Tour I’ve included a chart to show the GC progress and they show Froome pulls out minutes on his rivals in the TTs compared to seconds in the mountains so more TTs could just see Froome ride away with it, no? Unless there was someone competing for GC that could perform better than Froome in the ITT? Someone like the World Champion? Close is too often conflated woth good. 2014 wasn’t close at all but the actual racing was pretty good for the podium and in the cobbled stages. Surely the answer then is 100km of time trials so Froome goes into the final few mountain stages several minutes down on Tom Dumoulin and has to attack in order to win rather than ride conservatively and defend? Every year the ASO shrinks the number of TT kilometres yet the result is not a more thrilling race nor a French winner, so time for a rethink I reckon. Generally, a few more TT kms might be a good thing. But I don’t think Dumoulin would gain all that much time on Froome in a TT in a grand tour – and the later it was in the race, the smaller that difference would be (and they’re usually late on). This would be unlikely to get close to compensating for the time Froome would likely take in the mountains. So, at the moment, the more likely way to get a non-Froome winner (if that is the desire – it’s not mine) is fewer TT kms. You present one valid option. Stick in two good time trials, as in 2012, and make Dumoulin commit to the race. At least then we get a head to head instead of the same guys who can’t beat Froome trying to beat Froome again. Yes, because unless Froome is injured or falls ill Nibili/Bartet/Au/Quintana/Uran/Porte/Yates/Yates etc aren’t going to beat him on one of the courses the ASO have thrown up in the past few years – it will take more than a few Roubaix cobbles to really change things. You’re assuming that reality isn’t a probabilistic thing – but it pretty much is. In 2015 Froome might have lost to Quintana, as well. Moreover, in 2014 he would have very probably lost anyway also in different ways than the one he happened to. And that’s speaking of TdF only: after all, it’s not like he hasn’t ever lost a GT to rivals in equal conditions. What I’d throw in the equation, anyway, is the mutant ability shown by Froome and his team to adapt to the course. Up to a certain point, it’s something quite normal and happens with several other riders (shave some weight, work on sprint etc. ), but in Froome’s case it’s pretty much extreme, although even he needs several months to make a full change (his climbing skills in the 2012 Vuelta, after the flat ITTs of that year’s TdF looked way more modest than in other years). That’s what makes him really special, and that’s why I really can’t see working much on the ITT/climbing balance as one of the best means to limit Froome (why that, by the way?). If anything, they should try some serious mountain marathon or some complicated hilly stage, but even that wouldn’t be enough unless the other teams change their approach. Again, the best team with the most suited rider for the prevailing kind of efforts win, that’s sport. We may discuss if it’s healthy or sustainable for the sport to have a team which is the best… with a budget which *doubles* or more than doubles 80% of its rivals and which is anyway 15 to 25% superior to its very few closest chasers in economic terms. I think that it’s a problem, but once you allow that… it makes little sense to prevent them from winning! Sure: cycling, even more than the majority of other sports, isn’t just about the money. A certain budget difference can be easily overcome by technique, know-how, strategy, alliances etc. – but 2x? “Froome isn’t the best rider” are you sure that’s true? Froome has won two Grand Tours in a single year! If he just focuses on the Tour next year he will be more than capable of overcoming these stages. I want him to go for the Giro though and if he does that then it will be anyones TDF in 2018. Indeed. But by then a lot could be gone too given all that comes before, eg Stage 10 is hard with the Croix Fry and Glières etc just to leave some trailing. Interesting graph on the ITT kilometers. 30ks seem very few to me. I think 50ks should be a minimum. And I am not so sure that having this ITT in the very end is necessarily the best idea. For the rest interesting additions and cool to have the cobblestones back. Having it at the end is the old classic “banker”… if Dumoulin does ride, and can stay as close as possible to Froome on the hard stages before the ITT – anything could happen… while Froome will be thinking the same thing regards the pure climbers. Watching Andy Schleck’s dream of winning the TdF in yellow slowly die actually happened the stage before the ITT. Everyone knew, if not himself, that he would never win with the time gap he got. If you have ever watched the Road Uphill you can watch it over and over. They were ‘hapless’. No Porte as a contender? He’s there, just a brief sentence but it’ll be interesting to see how he approaches 2018, will he go for the same approach of winning several stage races on the way again or does he have the assurance to focus more on July. There’s a weird symmetry to Froome and Porte, and Armstrong and Hamilton. They are all very different personalities, but Porte’s career seems to match Hamilton’s – plucky but hapless riders. I found no Uran reference surprising too. Not that he is the same level, but surely earnt a passing mention. Very interesting route indeed and some stunning and picturesque climbs, most notably Col du Pre, which has in my opinion one of the most beautiful views in the Alps looking over the Lac de Roselend. Col des Glieres is very tough because of its steepness, but the road isnt’t that bad, certainly not for going uphill. The dirt/gravel road has some very rough sections but for the Tour it will certainly be in better condition (as was the case with Kronplatz or Finestre during the Giro). The 65 km stage is quite interesting. 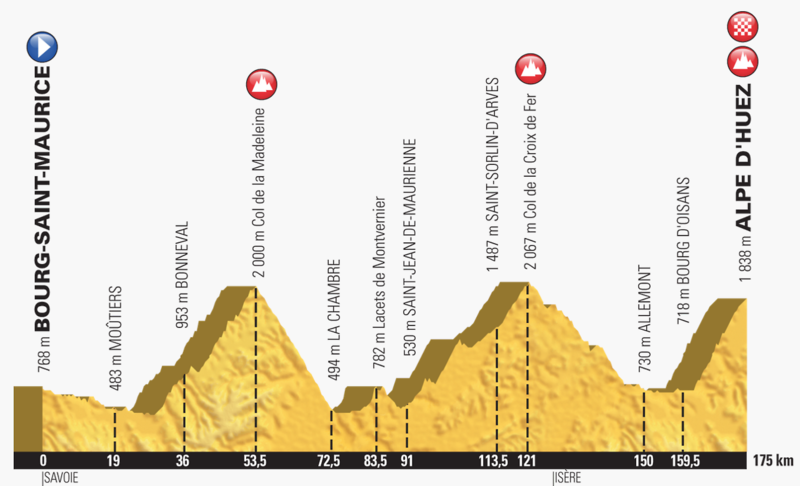 What I would have liked is to combine such a short stage with a mountain TT, to make it a double stage in one day. I don’t know when and if it has been done before during a Grand Tour, but this is an interesting idea to consider. I absolutely love the idea of the Roubaix stage, I still consider the stage in 2014 to be the best TdF stage for the last 5 years or so. As usual RonDe is sharp and has some good points. And ‘yes’ Landa was incredible strong and very importent to Froome this summer – but replace him with G and it might be even better. So Sky will be mega strong and I don’t see any other team in the peloton with the possibility of presenting such an allround strength – designed for the overall win in the 2018 version. I agree with most of you guys in here that we will not see Tom Dumolin in ‘le Tour 2018’. He’ll probably try the Giro/Vuelta double next year. If they can hit their level, I’m looking forward to see Barguil and Chavez – and remember I’ve told you now, Fuglsang will be a serious contender!!! We’ll be sure to remind you when Fuglsang cracks, and conveniently forget if he finishes top 10. I wonder if froome focuses on the giro as it is his chance to having won all the grand tours after another. Maybe the cobbles also make him worry more than they should? Cobbles should make everyone worry. Even the greats have crashed, punctured or had a mechanical in the middle of a cobbled sector with no team car to help. Should Froome be more worried than Porte, Landa, Quintana or Bardet? I don’t think so. Agreed, Froome has awesome support for the cobbles. Thomas, Moscon, Rowe and Stannard have all been top 10 at Paris-Roubaix. Thomas and Moscon can climb too so he isn’t even sacrificing mountain support there. Nibali should be pleased with the route. He bossed the cobblestones like a Flandrian hardman in 2014. Few ITT kilometers. Punchy steep finishes. Ambush stages. However, TTT isn’t Bahrain Merida’s strong suit. I hope a few teams can show up with squads that can assert themselves. Ag2r gave it a go this year, best they could. If two or three teams can assemble muscular squads that can take it to Sky then we have a recipe for a great Tour. Mainly because next year he says he wants to do Liège-Bastogne-Liège, the Giro, Vuelta and the Worlds so he’s ruled himself out. It’d be better if he ruled himself back in. Actually, he didn’t rule himself out at all. His trainer just said that they wanted to see the course of both the Giro and the Tour before deciding, although – sure! – the most effective programme towards the Worlds, which are the number one objective, would exclude the Tour. All the same, after having been heavily criticised by the Italian public in 2015 and even in 2014 for narrowing too much the focus of Nibali’s objectives, in the last couple of years trainer and rider decided together that they’d go back to a broader set of races. The consequence is that they haven’t ruled out the Tour yet; the two most probable (alternative) race calendars were published several days ago, before the TdF presentation, and one of them included the French GT. Froome and Nibali, who are similar ages, are at “make your mind up time” in terms of their careers now. They can see a few years ahead to becoming like Contador did and need to use the precious time they have left to create the legacy of their careers. For Froome this will mean, primarily, winning five Tours de France, and then seeing if he can add any bonus titles to his palmares, most important of all there would be a Giro to make a set of grand tour wins as his contemporaries Nibali and Contador did. For Nibali himself, who I freely admit has a wider skill set and is able to challenge at a wider variety of races, this will mean adding monuments (LBL and even Milan-Sanremo don’t seem impossible to me if the stars align) and maybe even the rainbow bands to his palmares before old father time decrees that time is up. Any extra grand tours he can win won’t be turned down either, of course. With very few exceptions, the sporting age is often more relevant than the birth year. Nibali started to be competitive in the then-called Pro Tour winning in first race in 2006 and getting a Pro Tour podium at the Eneco, as a neopro (and he was already getting top ten in Tour de Suisse stages or in the Milano-Torino the year before). In July 2009 he got a TdF top-ten and was third on the Verbier stage, only beat by Contador and A. Schleck. In that same 2009 Froome was winning his first elite race (and the *only one* until September 2011), a stage victory in a .2 race in South Africa. He had *never* top-tenned in *any* PT or even .HC race before (even if I’ll acknowledge his third place in the .1 Giro dell’Appennino as significant). Before September 2011, Froome was barely a competitive pro rider: he struggled to collect at least a handful *top-ten* for each season from 2009 to the start of the 2011 Vuelta (mainly at minor races lik Brixia Tour, Haut Var, Settimana Lombarda). Nibali had won a GT and podiumed twice at the Giro – he was even a better time trialist! It’s not hard to see how the two riders’ sporting age is quite different. At the very start of a rider’s career, the more you’ve raced at high level, the better. But as years goes by, it becomes increasingly difficult to train effectively (because of the physiology of training) the more years/kms you’ve raced at top level. Peaking becomes less stable and less predictable. I wouldn’t be surprised if Nibali had ridden 30-40% more kms of racing in his career, not to speak of the level which is also highly relevant and at which I’ve hinted with the data above. I’d say that in sporting terms, Froome is two to four further years younger than Nibali. Obviously biological age can take its toll, too, but Froome’s case is so peculiar that it’s hard to foresee how his career curve might work. Most historical GT top riders could be competitive at top level for about a decade, or less: Merckx, Hinault, Anquetil, Gimondi, Contador, Indurain, Gaul, Ocaña, Bobet, Delgado, Koblet, LeMond, Fignon, Ullrich, Rominger, Roche, Pantani, Tonko, Menchov… even the long-running Zoetemelk, perhaps the most famous “grandpa”, didn’t get further than 13 years in GTs. Evans was a peculiar case (you might count 2002), also because of his MTB activity, but he really couldn’t broke the rule, just as Basso (who got through one of the longest “true” doping stops in recent years). Maybe Purito and Sastre (and just barely, like 11 years), but they were often racing as a gregario, which is quite different – while at the same time revealing. But also notice how Coppi and Bartali had a longer time interval between their first and last big GT podium, having stopped for the war (and despite the negative effect of the war on alimentation and so). Armstrong is another interesting example due to his change in physical type, perhaps these latter are the model we should look at to understand Froome (doping questions aside). Peraud, Riis and Horner further prove my point from different POVs – …while Valverde is until now the most manifest exception to whatever. I wish Froome would aim for L-B-L (and why not the Lombardi, especially given the 2018 Worlds should be very much on his radar?) Surely, of all the classics, those are two in which he would viably enter as a favourite? Tactically, he might not have it, but physically, very much so. Until know, he’s proven himself *physically* not very suited to the more unpredictable effort distribution which is typical of one-day racing. You can see that it’s not just about strategy because his effort becomes simply less effective when he’s got to produce it in a moment of the race which couldn’t be planned. But that can be trained, too. Good points, Gabriele. I’m not sure I _quite_ agree, given he’s proved capable of impressive bursts of effort and anerobic activity in single stages of races; however, I get your point and largely agree with it. Classics are indeed different beasts. I’m guessing that the weather in L-B-L wouldn’t necessarily be to his liking, either, now I think about it. Do you think that the week later start due to the World Cup might make this more attractive to a Giro-Tour double attempt? Do you think it is a climber’s course Inner Ring? Cobbles and gravel, wind and weather on the NW coast and southern France potentially, TTT and ITT? A course that giveth and taketh away if you’re a climber? I think it would make a great test for Dumoulin and a podium may be possible although, having said that, a re-match with Aru, this time in Italy, appeals too. British bookies have Froome and Dumoulin as first and second favourites respectively, with Quintana down at fourth favourite. Nibali at 25/1 looks very generous. Yes, it’s very generous if you consider that he might not be racing (well, just as Dumoulin… but the bookies obviously also take advantage of people’s prejudice and ill-placed expectations). If Nibali raced, he’d be among the favourites as one of the best all-around GC riders, even if he’s aging. If the Giro 2017 had this course, he’d probably have won it over Dumoulin with a more than decent margin. It’s not like this course is perfect for him (it isn’t for anyone in particular, that’s why I kinda like it): he won’t like the TTT nor the need of a strong supporting team in the first half of the race, the two super short stages (out of six mountain stages! ), the lack of altitude or the fact that no mountain marathon ends with an especially selective finale. But several other charactetistics of the route are clearly quite good for him. I don’t know the answer to your question but the gravel will have zero influence on the race. The Glières gravels is smooth, only 1.8 kms, and a 100 kms from stage finish. The Portet gravel is apparently being paved. The last 2kms apparently not on the Portet. Cobbles will shape this race; no mention of Nibali? Is He committing to another grand tour? The Tour always seems really exciting around this time of the year. Come the end of the first week when Sky have shepherded Froome through the cross winds and bossed the TTT whilst everyone else has lost minutes it will seem decidedly less interesting. By that stage Aru and Nibali will be on a beach somewhere having duked out the Giro with Dumoulin, Fuglsang will have remembered he’s a solid also ran, Quintana, Bardet and Uran will be preparing to be ground into submission in the alps and Pantano will be an hour down and looking forward to getting into a few breaks with Barguil. I’d be very surprised if you’re wrong, Richard. How about Uran? I think he’s worth to be metioned. Last ITT suits hi. very well. Hoping for better weather in 2018 than the hours of rain we endured while sitting and waiting at Hornaing in 2014. Missed the 2015 cobbled stage but planning to get to Cysoing next year before chosing which of the following sectors to watch. ASO have clearly tried to respond to the image that the other GTs are dynamic and unpredictable while the TdF is seen as staid. The course will certainly do this to some extent and the reduction in rider numbers might help too (big/rouleur type guys needed in the opening week and for the TTT which maybe will leave less support in the climbing stages). It still seems to me that the importance to teams of the TdF will continue to impose control and predictability while the Giro and, even more, the Vuelta are events where success is highly desirable but not essential. The short stage which will may produce big gaps will come too late to change the overall impression the race will provide. Finally, it seems good for Porte with the TTT (Dennis, Van Garderen..), the ITT while he should be as good as any in the mountains. And yet Sky have guys like Kwiatkowski, multiple Strade Bianche winner, Milan-Sanremo winner, Gianni Moscon, 5th in Paris-Roubaix and 3rd in Lombardy and Geraint Thomas, several classics podiums, that can do the first week job and be there in the mountains too. Its these “Swiss Army Knife” type of riders who will be worth their weight in gold in the Tour 2018 meaning that team personnel and their skill sets will be vital. I don’t really see how an 8 man team could possibly be much better in 2018 if you take into account certain riders wanting their own opportunities (ie a Sagan or GVA etc). As you say Dave (me too) and RonDe, what a team. Take minor issue with your examples of world class climbers. For me a world class climber is capable of staying with, say, Quintana or Bardet on the Ventoux or Tourmalet. That definition would permit Poels but exclude Kwiat, Moscon and Thomas though a least one could probably stay with Froome to within a few kms of major summits – and maybe that’s enough. Agree for the TTT power and balance too. Now 8 long months to go and counting. I’m not sure people have selected the right sport for their interests. However, I’ll take advantage of the subject to make a point. Not every kind of stage is structurally the same. For example, you can use different tools to counter a climber in a mountain stage: your team, pacing yourself or, on the contrary (if the climb is suited), staying on the wheels and hence taking advantage of the – often relevant in the TdF – slipstream effect. An ITT isn’t about facing your rivals and you don’t have many different options you can recur to in order to “counter” them (barring some little details which rarely work in present days). It’s an athletic exercise. And while you can work on at least two elements to become a better climb (power to weight), you don’t have as many option to match a heavier rider as a chronoman if you don’t have the mass (even if skills count a lot, both aero and mental ones). I’m not saying one is good for cycling and the other isn’t (just check my opinion about ITTs), but you just shouldn’t think that they’re symmetric. Same goes for the length and the altimetry of a stage: with the proper strategy, politics and team strength, you can transform a long mountain marathon in a low effort stroll, but there’s no way you could possibly make of a 65 km stage an exercise of true endurance, not even going hard from scratch (not only because it would be short in time anyway, but also because the need to raise intensity proportionally will make it explosive). Even in this case, no structural symmetry between the two supposed “opposite poles”. Obviously, same can be said for extreme gradients, even if the available gear ratios have changed the scenario: however, even so, on any over 12% climb the slipstream will hardly count and the weight will become more and more relevant as the gradient grows, until you’ll have a one-sided kind of exercise. My other usual complaint is that TTTs favour the big teams too much – and this one’s far too long. Can’t believe it’s October and people are already suggesting that Froome isn’t the favourite. He showed he’s the best grand tour rider this year and still looks like having the best team – I can’t see that changing too much in 9 months. Froome is definitely favourite, but I would say that this is a course more likely to beat him — all over things being equal — than previous years’. First, it has a higher chance of random accidents/mechanicals, with its cobbles (which I do not like in a grand tour for that reason) and gravel tracks. Second, there are fewer ITT kms, and those there are not the kind of straight line, flat assault that Froome would enjoy best. Third, the mountains, despite the ASO fashion for fewer summit finishes than usual, seem harder and more liable to lead to greater time losses to pure climbers on good days, or on Froome’s bad days. I don’t think that Tom Dumoulin will compete, but Porte, Bardet, Quintana (if he can get over his pathological conservatism) and Landa will all threaten Froome on this course, along with the course itself, which appears designed to hang the sword of damocles over everybody’s head for the first week and beyond. I can’t help but think that Bardet will be around 1:30 and Quintana 1:00 down on Froome after the Classics stages and TTT. Or, let me put it another way… AG2R and Movistar don’t have the same horsepower or technical skill to match Sky (and BMC) in those early exchanges. I like the idea of thinking about riders qualities in different terms than the usual chronoman/climber, even more so since mountain stages were often being reduced to uphill ITTs by race strategies or sometimes by the race design itself. The climbers will be tested and anyway suffer through the first half of the race. Heavier riders will get to the mountains with an advantage in terms of condition which will make them able to properly defend themselves or even to the drop the climbers – classical Tour de France style, but shaving that ITT excess which made the TdF a race limited to a narrower set of body types well into the years 2000s. That said, just as in any classic Tour, there are a little too many sprint stages in the first week (you could keep the same race concept of punishing the climbers but with some finales more suited to Classics riders – not necessarily Ardennes ones, more the “easy Worlds” kind)… but it’s a minimal detail, I think it’s like five of them and I’d have made perhaps four. I really like to watch a short TTT, but I don’t love it in the course of a GT in the reality of contemporary cycling because of obvious economic reasons. Yet, the 2018 one is fine because it’s quite short and, as others said above, it will force teams to choose a more balanced team, theoretically leaving less option to shut the race tight in the mountains. But truth is that this will be true for teams with more limited resources: if you can buy several captains who time trial and climb well to work as your gregari, there you are. The risk is that you actually *multiply* – instead of reducing – the effect of the currently disproportionate economic inequality. However, let me say that the good thing of TTTs is that it kind of rewards hard work. Part of the economic difference can be made for by technical skills. And that’s good. And, frankly, the Giro did better from any course-related POV when, with Vegni, great ITTs got a significant role again (even if last year wasn’t balanced enough, but that’s fine, too, from time to time). Besides that, I’m worried by the fact that it’s not that easy to make a good formula work: French climbs are often way different from the Giro’s, as are the kind of roads, the distribution of the population (towns), the country’s general conformation; and the race itself has different necessities (logistics) and racing style (greater mediatic pressure). It’s to be seen what really works – the 2016 Tour didn’t despite having, on paper, a very good “Giro-like” course. And the 2017 Giro, despite a premium podium and a better final GC top-ten than the Tour… still wasn’t worth a Tour (IMHO). That said, I think that, as a whole, the 2018 Tour preserves quite well its most traditional identity thanks to its first half and several “soft” finales in key mountain stages. Again, a longer, flatter, earlier ITT would have been appreciated, but it’s a minor detail. Finally. I don’t like the 65 kms stage. Ok, it’s an experiment. Then, let’s avoid the other junior one-hundred-km stage. They can be funny but it’s a different sport. A third part of all the available mountain stages, and 2 out of 3 uphill finishes deprived of the endurance component? At least, they should have tried a better combination. Riders with an attitude for endurance won’t have many opportunities to transform it in a relevant difference. The 65 km one is laughable, it’s more akin than we could think to a TTT: it’s short enough to allow you to plan the whole effort. Well, it would have been the distance of a typical TTT (even if the climbs will make it a bit longer) and the Giro included ITTs (!) of similar length a couple of times over the last decade – including more or less significant climbs, too! And 65 is radically different from 100-120. The Giro did something like this in 2009 and the comparison with the previous hard-men stage was humiliating – in terms of mere spectacle – for the 80 km stage. The insistence on short, planned efforts – be it because of the racing style or for the course – hasn’t been helping much the TdF’s quality and audience results. But, sure, football supposedly works on TV, football lasts 90 (mainly “boring” for the uneducated spectator) minutes, that must be the perfect secret formula. Yeah. Let’s ignore reality and go for marketing spins. Polemica asides, I’m exaggerating a bit. If it’s an one-year thing, then ok. It always happened, even in the more distant past. My worries are about it becoming a trend, with some interested parties lobbying for it, but that’s a whole different story. Let’s enjoy a generally good course, way better than the Tour’s average, both innovative and classic, apparently balanced and open, and let’s hope it’s raced as it deserves. If the Tour does lack the presence of Nibali, Aru and potentially Dumoulin and Pinot (all maybe Giro-bound), is the GC contest worthy of the course? It could be tough for Quintana / Landa / Valverde, Bardet, though possibly less so for Porte. If the former four riders are missing, the Green Jersey competition end up more appealing? Out of interest, how did the 80km Giro stage go, Gabriele? I think the 65kms stage looks great. Lots of highly selective climbing, and a distance where contenders can make multiple attacks, letting it all hang out, and thereby put serious pressure on eachother. I think it’ll be carnage, and great. But I’m also aware that that’s a guess and instinct. What was your experience? It was different from this one since it had just a single final long climb. They went deep meaning high speed and a greater relevance of slipstream, but what you could notice the most was the tilting against endurance riders (see my comment below). It’s very interesting because we can check the form level of the competitors thanks to the 237 km Queen stage which happened just before and the final Vesuvio stage, a normal 167 km one two days later. Sastre won the other two stages and looked the strongest uphill but on the short one he lost over 1′ to Menchov and Di Luca. Basso, another classical endurance rider, was on par with the two leader on the marathon or classic mountain stage (losing some seconds in the final rush, as usual), while now he was distanced a little before, even if he lost less than 20″. A chronoman like Bruseghin could defend himself way better than on the other couple of days, when he lost a total of 5’30” to Sastre, while on the Blockhaus the two arrived together (check against Menchov: 4’30” in the traditional stages, 1′ in the sprint one). Bruseghin had a past triumph in an uphill ITT, by the way (guess what? Oropa! Where a heavy rider like him kicked the a** of Piepoli and eventual winner Di Luca, shortly followed by… Zabriskie. That’s the sort of climb Oropa is). Strong uphill time trialists were more brilliant than you’d expect in any normal endurance stage. Have a look again at that Oropa ITT and you’ll find Pellizotti and Garzelli tracking the four best guys. They’ve got in common having smashed each their separate Plan de Corones uphill ITT – and their career includes more ITT top ten than you’d expect. In the sprint Blockhaus stage Pellizotti won and Garzelli was runner-up. They were in good form but they both had lost 1′ in the previous Queen stage (and Garzelli wasn’t going to be brilliant on the Vesuvio, either). OTOH, two typical endurance riders like Arroyo and Serpa evidently underperformed. Crossing performances allows us to be sure that it wasn’t about a good or bad day by a single rider, it was a significant trend which could switch results by one minute or more according to the specific characteristic of the rider… within a group of otherwise *very* similar GT specialists with strong climbing skills. But, as I always said, “climbing” isn’t a single easily identified skills, it can vary a lot depending on other factors. I find it perfectly appropriate that we test the group of GT specialists with strong climbing skills over a set of very different situations… but that’s precisely the point. When we push in a single, specific direction, the final results will reflect just that single disposition. A guy can beat the other 9/10 times climbing… if the type of stage/race/climb is always the same. But if the situation changes, the effects can be dramatic, as that Giro showed. And if that single disposition we decide to foster (less endurance racing) ultimately produces a less interesting kind of racing (high speed climbing over the last 3 kms – or less! ), perhaps we should be even more careful. Thank you for that. Extremely interesting. I think it’s a great idea to have one such stage in a tour, and I’m not averse to two. 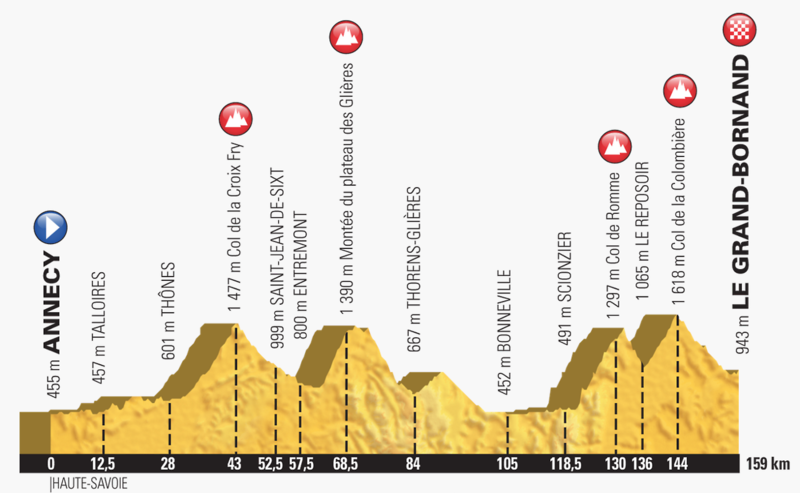 We have the Fer-Alpe combination this time, too, which is a classic Tour stage, so I think there’s a balance there. Would like to see one more mountain finish, instead of one of the downhill ones, but there you go. Also happy to see the inclusion of a more Giro-Vuelta style mountain this time. Unhappy about the pave. Should be interesting, though. Thanks again for the intel. I can understand why only short mountain stages, while everyone enjoys the war of attrition, the negative racing by numbers approach normally make these stages a procession. At least the < 100km shorter mountain days generally lead to attacking, proactive racing from start-finish. I don't expect that to change in 2018. Geraint Thomas must be feeling quite happy about this route. He'll be 2nd in command at SKY – and likely to benefit from the same time gaps as Froome in the first week (TTT). He'll be at home on the cobbles/dirt. Aside from maybe Portet and Alpe d'huez he's got a good basis for defending his position, and consolidating it in the final iTT. Should something happen to Froome, he could be a great outside bet… despite not yet making top 10 in a GT. “At least the < 100km shorter mountain days generally lead to attacking, proactive racing from start-finish. I don't expect that to change in 2018". I guess you meant the < 150 km stages or something like that (< 120, < 140…), because the adverb "generally" isn't very much appropriate with under 100 km stages… there's no broad or general set you could easily refer to. And, mind the statistical curiosity, those famous ones we tend to think about always included Contador as the figure who produced the attacks. The impact those had makes it easier for us to forget about the less significant ones (sort of a selective memory bias). Once a stage is good in the finale (a final part as long as it's possible, obviously, let's say one hour, which is rarely happening in the Tour – but that's a separate problem), why would you really need it to be fireworks "from start to finish" (which is not going to happen anyway)? As I've shown elsewhere, although under 150 km stages can actually be good and action-packed, there are several of them in which nothing special actually happened, just as many memorable mountain stages were over 180 kms or even over 200 kms. The problem is that the Tour is offering little spectacle most of the time; at the Giro you can easily see how both kind of stages (not under 100 km, sure, but around 130 km or so) can provide great entertainment far from the line. OTOH, you can have two well designed and short final mountain stages as in the 2015 or 2016 TdF and one of them proves interesting (albeit with no "action from start to finish"), while the other is absolutely dull. In 2011, the 109 km Alpe d'Huez was great… but so was the 189 km Galibier one the day before. In 2013, the short stage to Le Semnoz offered an interesting *finale*, but those which had some longer conclusive action were Ax3 Domains (Quintana attacking on the penultimate climb) and the Ventoux, 195 and 243 kms respectively. The shortening of stages responds to a different agenda but is being sold as a spectacle panacea; yet, if abused, it could bring more harm than benefit to cycling. I'm fine with a short stage, and the exceptional *very* short stage can be used with care, too (it belongs to the tradition of the sport, after all, we had several of them in the distant past). You just shouldn't forget what that means, for example that in 2018 you'll just have one single uphill finish suited to endurance riders. And it's not a detail, a matter of personal taste, because the prevalence, especially at recent TdFs, of more riders tilted towards explosive effort rather than endurance is precisely what ends up killing the middle to long range action from relevant GC figures… also note how in 2016 and 2017 several Classics riders show up in the high TdF GC when compared to the past. They've shown in other GTs that they're not really *that* competitive (even if they're good, for sure, and I like that they test themselves on different terrains): it's more about the TdF mountain efforts being reduced to explosive efforts. On the one hand short stages could change that, going hard on multiple climbs (hoping that will they really do that), but on the other hand they will be able to go that hard because the endurance component will have been removed… which means that maybe they'll go faster but not necessarily *harder* than usual. Stage 9 coincides with the FIFA World Cup…. Final? Opening Match? Nice balanced route with something for everyone. Thomas of Ghent will surprise everyone. Bloody hell, its in France again! whooda thunk it. Love the route and thanks for the preview as always. Late to the party, so apologies if it’s been covered elsewhere BTL, but la course being reduced back to a single day feels like a step backwards and a shame. The more productive option, for Van Vleuten, would be to avoid a fixation with the Tour de France, for all the exposure and status it may offer. “I think maybe the Tour de France doesn’t want La Course as a stage race, because the Tour is already big enough. Maybe it’s not realistic that the Tour de France organizes it,” she said. “But we already have amazing races. The Women’s Tour is a really great race – it would be good to have live television broadcast for that, and make that our biggest race. The Giro, it would be a really good move to develop that race, and maybe change the schedule so it’s not on at the same time as the Tour de France. Little bit surprised they missed out on the opportunity to get some of the Tro Bro route in whist over that way, but I guess they felt they might be pushing their luck adding that to the Roubaix stage “competing” with the World Cup. I’m a bit surprised too. But then from ASO’s perspective, is that sort of terrain just too ‘risky’ in terms of the possibility of injury or of luck unduly influencing the outcome of the race (this is already a risk with the cobbles). If you’re ASO, and you wanted to give the ribinou a ‘test run’ in some smaller race, how would you do so? I’m assuming that Tro Bro Leon is insufficiently comparable to the TdF to gain much usable knowledge. Could they send the Tour de l’Avenir over the ribinou?